Once again, Public Citizen will be at EarthX Expo at Fair Park in Dallas, TX from April 26 thru the 28th celebrating Earth Day. Stop by our booth in the Centennial Building #4742 . The Expo is open from 10 AM to 6 PM each day. Need Directions getting there? Click here. And you can register for free admission by clicking here. There will be tons to do and see. Check out the event guide by clicking here. And don’t forget to come by and visit with us! As more Texans look to solar energy to power their homes and businesses as a way to save money and reduce greenhouse gas emissions, Texas Sen. Jose Menendez is working to win passage of a bill that would provide standards for the industry in the state. 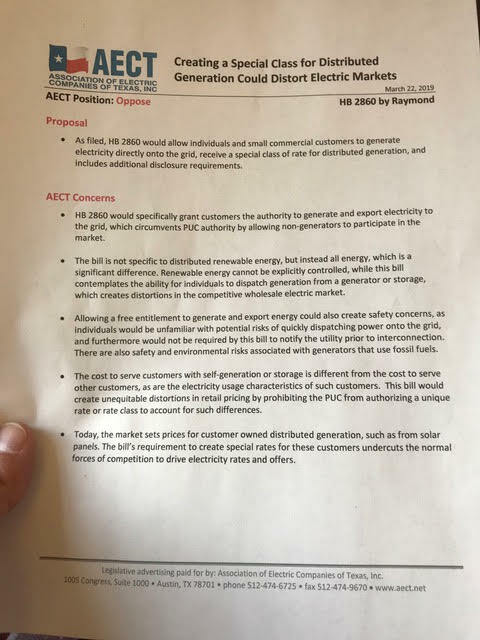 CSSB 2066, sponsored by the San Antonio Democrat, aims to give residential and small commercial customers in many parts of Texas standards they can rely on when considering the use of distributed generation. 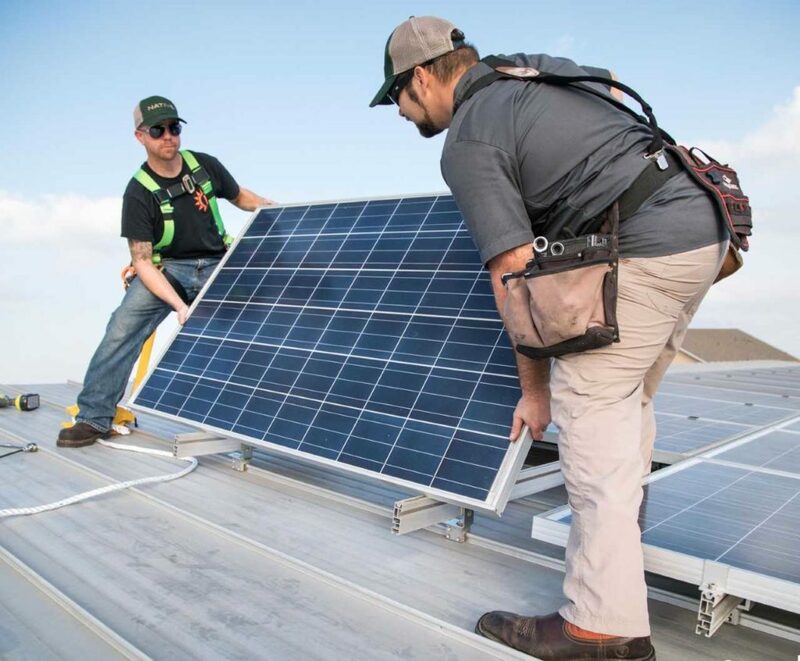 A steady uptick in the number of small businesses and homeowners switching to solar is improving affordability for residents, reducing operating costs for businesses, and creating local jobs. 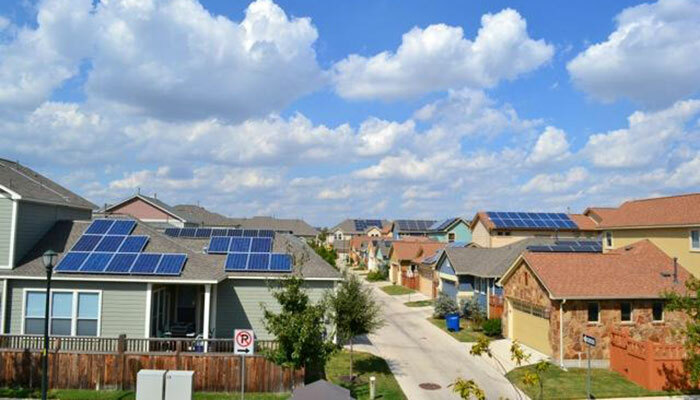 There are now over 50,000 Texas residents and businesses using distributed solar energy. And over 9,600 people are employed in the solar industry in Texas. All of this is good news and the average solar customer has a positive experience and is happy to be paying less for electricity while doing something reduce air pollution, improve public health and address climate change. But, the lack of statewide standards has led to frustration and bad practices in some cases. This bill would start the process of standardizing what should be included in a solar lease, and where and how customers have a right to utilize distributed solar energy. 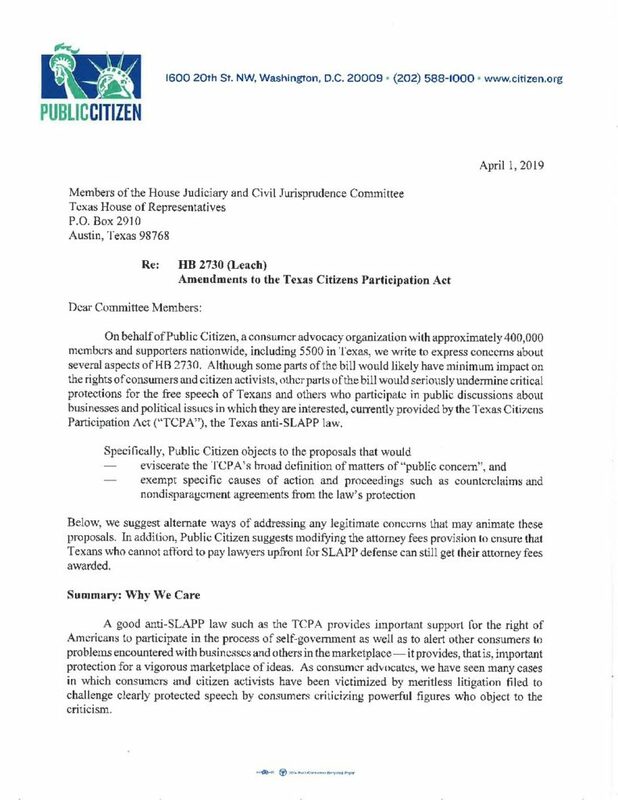 To learn more about this important legislation that Public Citizen supports, read the full testimony from Adrian Shelley, director of Public Citizen’s Texas office, below. 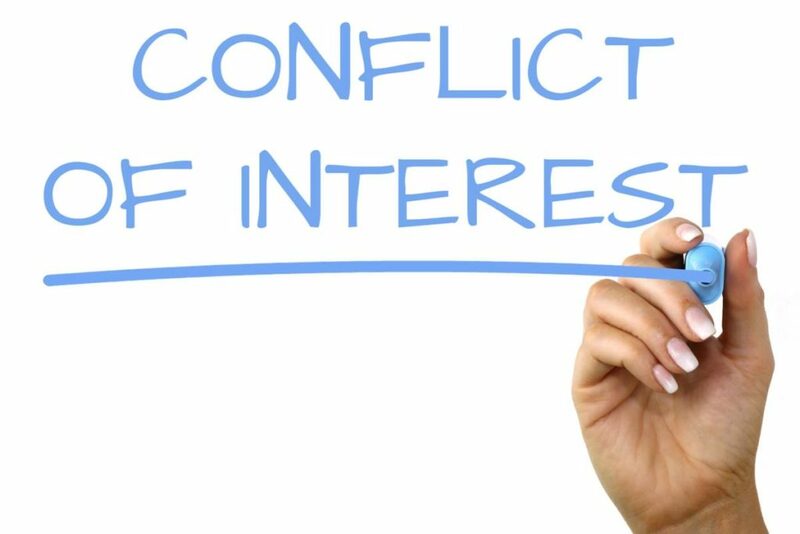 Public Citizen urged state lawmakers today to support HB 784, an important ethics bill that would create a criminal offense if members of state agency governing boards and governing officers fail to disclose conflicts of interest and recuse themselves from decisions when such conflicts arise. This bill continues a multi-session trend by Rep. Sarah Davis, a Houston Republican, to try to improve Texas’ notoriously weak public ethics laws. In fact, in a 2015 state integrity investigation by the Center for Public Integrity, Texas was given a D- for its poor ethics laws. HB 784 defines a “financial interest” as a five percent ownership or control interest that could result in a financial benefit. In the past few weeks, the Houston area has experienced three major chemical fires, releasing toxic pollution into the air and water and killing one person. The Texas House Committees on Environmental Regulation and Homeland Security & Public Safety are hosting a “public hearing” this Friday (April 5) about the “ITC incident,” but only allowing invited testimony. That means the people from the Houston area who have been suffering from these disasters don’t get to speak! So we’re having a rally & press conference to give effected residents space to share their stories. Whether you’re from Deer Park or another part of Houston or just want to stand in solidarity with frontline communities who are being polluted and silenced, we invite you to join us. 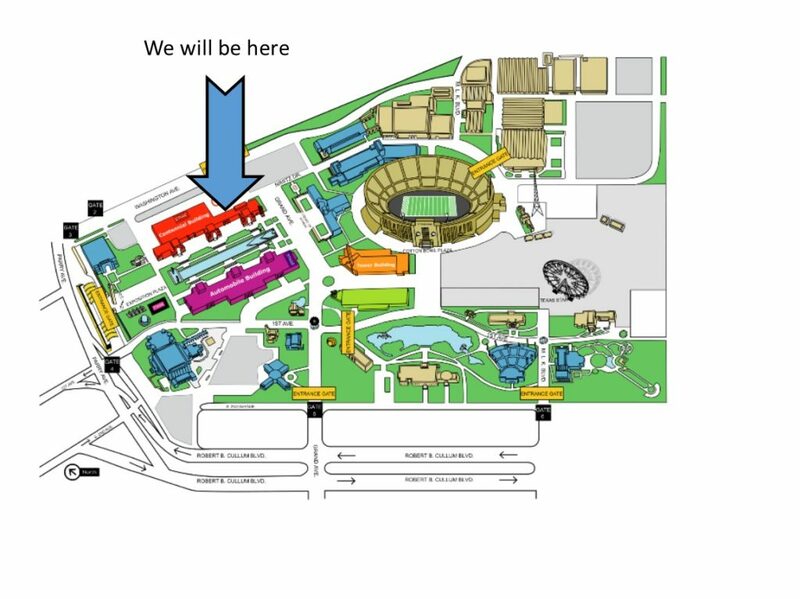 The rally and press conference will be at 9:30 in the Open-Air Rotunda in the Capitol extension (E2). photo by the Houston Chronicle on the first day of the fire. The joint hearing will take place at 10:30 AM or upon adjournment of the Texas House of Representatives, at the Texas Capitol in Hearing Room E1.030. Or you can stream the hearing live at https://house.texas.gov/video-audio/. We have heard there will be a hearing in or near Deer Park after the session. The last day of the regular Texas Legislative session is May 27th. It’s time to demand that U.S. Attorney General Robert Mueller release the full, unredacted Mueller Report to the American public. 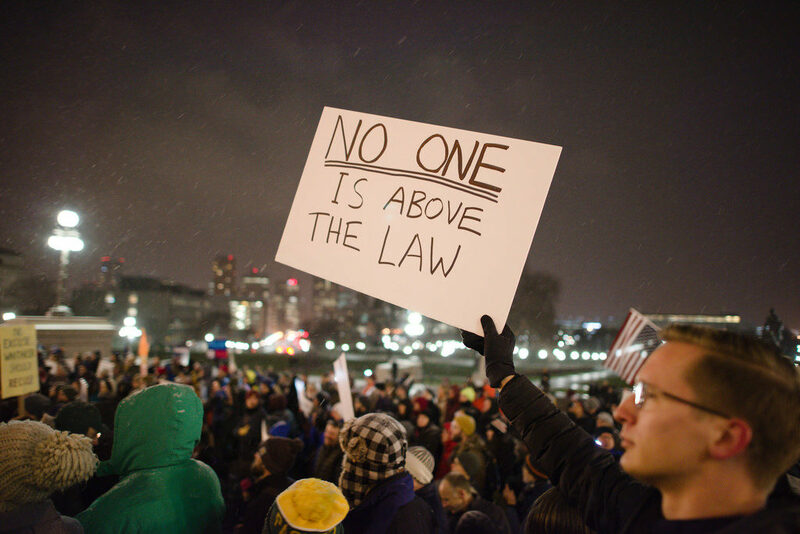 That’s why Public Citizen and others are participating in peaceful street/sidewalk protests in major Texas cities and around the nation on Thursday to insist that Trump’s hand-picked attorney general release the full report. Barr missed a congressional deadline to release the report on Tuesday night. We deserve the full report and congressional leaders and the American people expect it now. Here are the Texas events. We hope to see you out there! WHEN: Thursday, April 4 at noon to 7 p.m.
WHERE: 6th St and Lamar Blvd or your neighborhood! We will be there ALL day, 12 noon to 7p so people can come when their schedule permits. We are taking our message to the streets. Fill the sidewalks with our DEMAND that the Mueller Report be released in full and unredacted form. Bring your signs. We will be in a very busy area and able to impact THOUSANDS. Numbers Matter. Let our Legislators see that this matters to us!!!!! 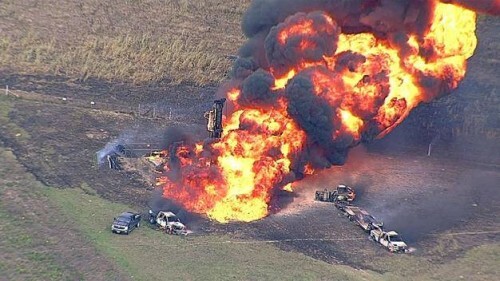 Note: Today, an explosion and fire erupted at the KMCO chemical plant in Crosby, Texas, near Houston. One person is dead, one person is missing and multiple people have suffered injuries. The incident follows recent chemical fires in Texas that have led to public health and safety concerns. Statement of Stephanie Thomas, Public Citizen’s Houston Researcher and Organizer. 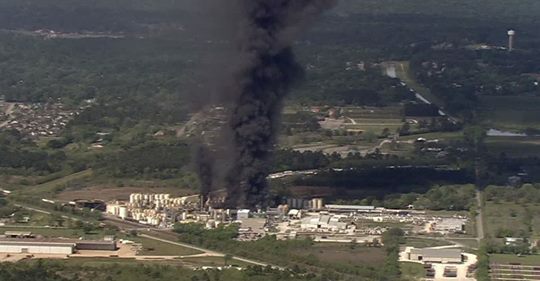 Today’s incident in Crosby is the third chemical fire in recent weeks, highlighting the insidious nature of corporate pollution in the Houston area and many other areas in the country. We no longer can accept a culture that places profits before people. 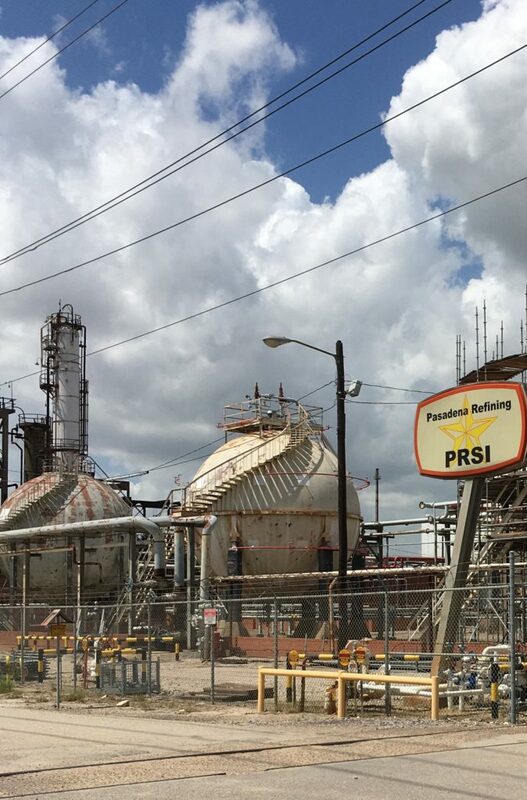 The Texas state government has a record of lax enforcement, and the Trump administration is rolling back necessary protections for workers and people living and working in the shadow of chemical plants. These sequential disasters highlight the dire need for more and better protections for these fence line communities. Polluters should not get a free pass to pollute our communities and harm our neighbors. 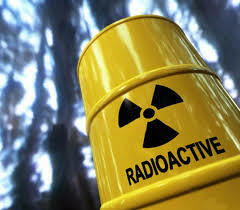 How many disasters must our communities endure before our elected officials wake up to the need for better protections? How many people need to fear for their health and safety? How many workers must be injured or killed for government to act? 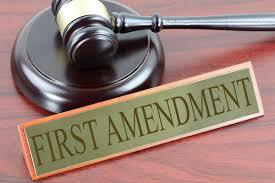 A pair of bills under consideration in the Texas Legislature would diminish some free speech protections for Texans, and today Public Citizen joined other First Amendment champions to speak out on the legislation. In essence, Public Citizen’s fears that HB 2730, sponsored by Republican Rep. Jeff Leach of Plano, would seriously undermine critical free speech safeguards for Texans who participate in public discussions about businesses and political issues. Such speech is currently protected by the Texas Citizens Participation Act – commonly known as TCPA, and also known as the Texas anti-SLAPP law. Adrian Shelley, Public Citizen’s Texas office director, and Public Citizen attorney Paul Levy submitted written testimony to the committee today that elaborates on our position. Shelley also testified in person during today’s hearing. Michelle L., a Florida woman who raised health alarms about a medical study she had participated in before becoming wary of the program also spoke out on the bill today. Michelle was sued in Houston (where her LLC was located) for raising public concerns about the medical study. Public Citizen’s lawyers took on her case pro bono and prevailed in part by using the TCPA law that Leach and others want to modify. You can read the official Public Citizen testimony in opposition to HB 2730 below. Representatives of Public Citizen’s Texas office will testify in a state House Committee today against legislation that would allow a major nuclear company to pay less to dump more contaminated waste. Rep. Brooks Landgraf’s HB 2269 is scheduled for a hearing late this afternoon in the Texas House Committee on Environmental Regulation. This bad bill would allow the expansion of Waste Control Specialists’ radioactive waste dump in West Texas and would eliminate the fee that the company pays to the state. A companion bill, SB 1021, sponsored by Sen. Kel Seliger, is scheduled for a 9 a.m. hearing of the Senate Committee on Natural Resources & Economic Development on Wednesday. If you oppose state policies that allow nuke waste operators to dump more while paying less for the privilege, please consider showing up at either – or both – hearings to register your opposition. Texas oil industry representatives are also expected to testify against the bills because they fear nuclear waste could contaminate the oil-rich Permian Basin. Meanwhile, read testimony from Adrian Shelley, director of Public Citizen’s Texas office, against Landgraf’s House bill here: HB 2269. 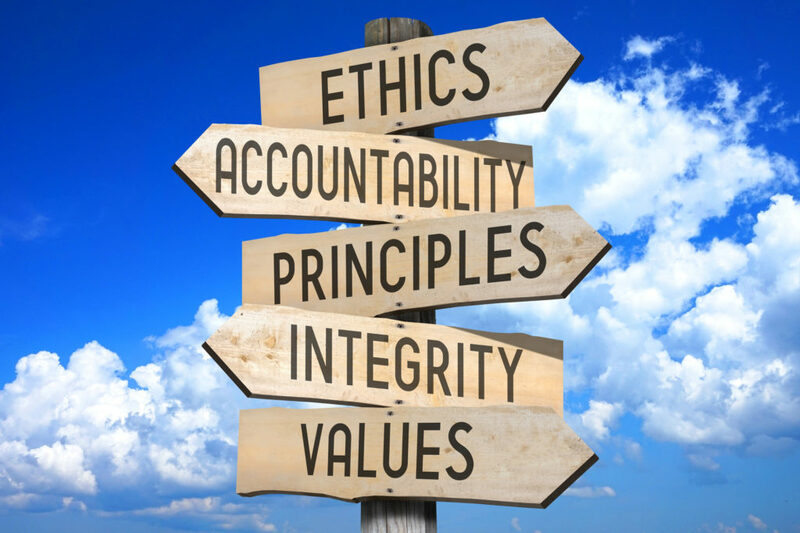 Public Citizen testified in the House State Affairs Committee this month about three important government ethics bills pending in the chamber. All three bills are sponsored by Rep. Sarah Davis, a Houston Republican. Public Citizen also testified in support of HB 1876, which reflects the recommendations of the Texas Ethics Commission. This bill would, among other things, address the “revolving door” of legislators-turned-lobbyists by barring a former lawmaker from registering as a lobbyist for one year, beginning with the first regular legislative session to convene. It would also ban political contributions during special legislative sessions. We also spoke in favor of HB 1877, which would enact eight different ethics-related bills that passed the House in the 85th Session of the Legislature but not the Senate. 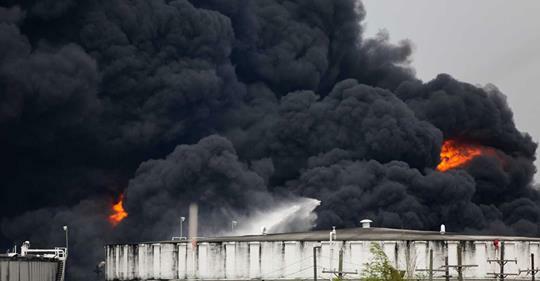 HOUSTON – A chemical fire that erupted early Sunday morning at the Intercontinental Terminals Company (ITC) plant in La Porte, Texas, and is expected to continue to burn through Wednesday shows the dire need for tougher regulation and enforcement, Public Citizen said today. 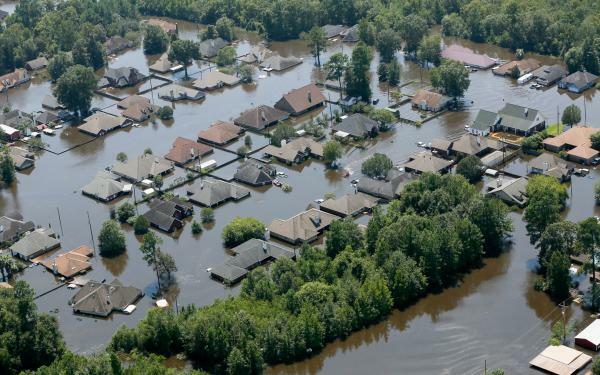 In addition, the disaster underscores the need for more public information from both the Texas Commission on Environmental Quality (TCEQ) and the U.S. Environmental Protection Agency (EPA) about chemical risks and disaster response efforts. The fire, which so far involves seven petrochemical storage tanks, sent a thick plume of smoke over the Houston region, forcing local officials to urge residents to shelter in place and cancel classes in both the Deer Park and La Porte Independent School Districts. At least three toxic chemicals involved in the blaze – naphtha, xylene and toluene – pose a danger to public safety. Short-term exposure can cause headaches, dizziness, confusion, breathing irritation, weakness and memory loss – with potentially fatal effects from longer-term exposure. The ITC fire comes on the heels of a separate, unrelated fire at ExxonMobil’s Baytown refinery on Saturday, which has been contained. A 2016 Houston Chronicle investigation found that chemical incidents occur once every six weeks in the Houston area. Public Citizen has called for restoring chemical right-to-know standards, so that first responders and residents who live near industrial facilities can fully understand the potential hazards of plants’ chemical inventories. The TCEQ needs additional staff and tools – such as a mobile monitoring unit for full-time use in Houston – to be able to adequately respond to pollution disasters, and needs to be more forthcoming with information about serious health-related incidents, Public Citizen maintains. As of 1 p.m. CDT on Monday, the agency still had not posted any information about the Houston fire on its website or social media accounts. “Industrial disasters are the natural and inevitable outcome of administration policy to let corporate wrongdoers off the hook, slash regulatory and enforcement budgets, and not update regulations to deal with serious health, safety and environmental risks,” added Robert Weissman, president of Public Citizen.